On July 17, 1944, in the midst of World War II, there was a major explosion at Port Chicago in California. Over 300 servicemen were killed and countless more were injured. It was in this port that hundreds of black servicemen were ordered, day after day, to load ammunition onto ships despite the fact that they were never trained how to properly handle such dangerous cargo. The men handling this cargo knew it was only a matter of time before an accident occurred. This deadly accident triggered a series of events that no one anticipated. On August 9, 1944, the servicemen of Port Chicago were ordered to resume loading ammunition. Joe Small, one of the black servicemen, simply would not continue to load ammunition. 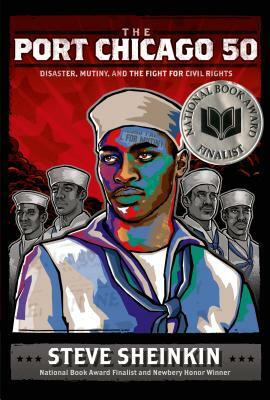 He was scared of what might happen and he believed the black servicemen were being singled out for this dangerous job. Others followed Joe’s lead and would not load ammunition. This group was charged with mutiny and faced a death sentence if found guilty. The Port Chicago 50 provides a riveting account of the events leading up to and following the explosion and sheds light on this little known tragedy and the trial that ensued. He reveals the layers of racism and prejudice facing black Americans in the armed forces and in daily life in the United States. This is a compelling read about a little known, but very significant event in United States history.